A cactus (plural cacti, cactuses, or cactus) is any member of the flowering plant family Cactaceae, native to North and South America and typically characterized by leaves that are reduced in size or ephemeral, enlarged plant stems, and spines that grow from areoles, a structure unique to cacti. Cacti are distinctive and unusual plants, with 2,000 to 3,000 species. Most live in desert or semi-desert environments and have many special adaptations in order to survive and thrive in hot, dry conditions. Cacti play an important role in the desert ecology and are a vital source of food and water for many desert animals. Some cactus species have been utilized by humans since prehistoric times, for various purposes including food and medicinal use. They are also popular as garden and house plants. Human activities have led to some species becoming endangered in the wild, while other species have created problems when they were introduced to areas where they are not native. The word cactus is ultimately derived from Greek Κακτος kaktos, used in classical Greek for a species of spiny thistle, possibly the cardoon, and used as a generic name, Cactus, by Linnaeus in 1753 (now rejected in favor of Mammillaria). There is some dispute as to the proper plural form of the word; as a Greek loan into English, the correct plural in English would be "cactoi" or "cactuses." However, as a word in Botanical Latin (as distinct from Classical Latin), "cactus" would follow standard Latin rules for pluralization and become "cacti," which has become the prevalent usage in English. Regardless, cactus is popularly used as both singular and plural, and is cited as both singular and plural by the Random House Unabridged Dictionary (2006). Closeup image of a cactus flower (Echinopsis spachiana) showing large number of stamens. The Cactaceae family, with around 2,000-3,000 species and varieties in about 60 genera, was originally native to the North and South American continents, where their range extends from Patagonia to the Canadian–United States border. They are also found on nearby islands. Cacti inhabit the most diverse regions, from coastal plains to high mountain areas, from the sub-tropics to the deserts. 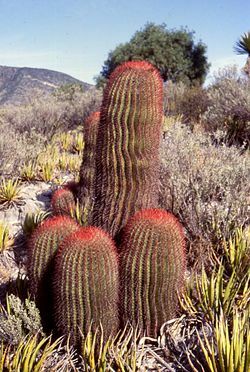 The most dense occurrence of cacti is to be found in the territories around north Mexico and the southern tropic (Argentina and Bolivia). The equivalent plants to cacti in Africa and Australia are representatives of the so-called "other succulents." There is, however, one exception to the American distribution, Rhipsalis baccifera; this species has a pantropical distribution, occurring in the Old World tropical Africa, Madagascar, and Sri Lanka, as well as in tropical America. This plant is thought to be a relatively recent colonist in the Old World (within the last few thousand years), probably carried as seeds in the digestive tracts of migratory birds. Many other cacti have become naturalized to similar environments in other parts of the world after being introduced by humans. Cacti come in a wide range of shapes and sizes. The tallest is Pachycereus pringlei of northern Mexico, with a maximum recorded height of 19.2 meters (63 feet) (Salak 2000) and the smallest is Blossfeldia liliputiana of South America, which is only about 1 cm (0.4 inches) in diameter at maturity (Mauseth 2007). The smallest cacti grow almost completely underground or in the cracks between rocks. Most species are medium-sized and are considered shrubs, while the largest are considered trees. Some cacti grow on the branches of trees. One feature distinguishes the cacti from all other plants: cacti possess areoles, as they are known. The areole appears like a cushion with a diameter of up to 15 millimeters (0.6 inches) and is formed by two opposing buds in the angles of a leaf. From the upper bud develops either a blossom or a side shoot, from the lower bud develop thorns. The two buds of the areoles can lie very close together, but they can also sometimes be separated by several centimeters. The duration of flowering is very variable. Many flowers, for example those of Selenicereus grandiflorus ("Queen of the Night"), are only fully open for two hours at night. Other cacti flower for a whole week. Most cacti are self-incompatible, and thus require a pollinator. A few are autogamous and are able to pollinate themselves. Fraileas only opens their flowers completely in exceptional circumstances; they mostly pollinate themselves with their flowers closed ("cleistogamy"). The flower itself has also undergone a further development: the ovary tends to become a completely protected area, protected by thorns, hairs, and scales. Seed formation is very prolific, and the fruits are mostly fleshy, pleasant tasting, and conspicuously colored. Pereskia grandifolia: Pereskia is a weakly succulent genus, which also possesses leaves, and is believed to be very similar to the ancestor of all cacti. 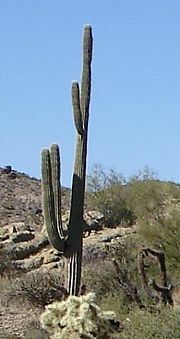 Many species of cactus have long, sharp spines. Cactus beginning to flower, with human thumb for size comparison. Some environments, such as deserts, semi-deserts and dry steppes, receive little water in the form of precipitation. Plants that inhabit these dry areas are known as xerophytes, and many of them are succulents, with thick or reduced, "succulent" leaves. Succulent plants are water-retaining plants adapted to arid climate or soil conditions. Succulent plants store water in their leaves, stems, and/or roots. The storage of water often gives succulent plants a more swollen or fleshy appearance than other plants. Apart from a very few exceptions (for example, the genus "Rhodocactus"), all cacti are succulent plants, although not all succulent plants are cacti. Like other succulents, these cacti have a range of specific adaptations that enable them to survive in these environments. Cacti leaves typically are reduced in the size so that they reduce the surface area through which water can be lost by transpiration. In some species, the leaves are still remarkably large and ordinary while in other species they have became microscopic but they still contain the stomata, xylem, and phloem. Certain cactus species have also developed ephemeral leaves, which are leaves that last for a short period of time, when the stem is still in his early stages of development. A good example of a species that have ephemeral leaves is the Opunta ficus indicia, better known as the prickly pear. Cactus have also developed spines, which allow less water to evaporate through transpiration by shading the plant, and defend the cactus against water-seeking animals. The spines grow from specialized structures called areoles. In some cacti, the spines on the lower part of the plant grow downwards to prevent rodents and other animals from climbing. Spines can also collect dew from the air letting it drip down to be collected by the roots (Benson 1969). In most cacti, enlarged stems carry out photosynthesis and store water. Much like many other plants that have waxy coatings on their leaves, cacti often have a waxy coating on their stems to prevent water loss. This works by preventing water from spreading on the surface and allowing water to trickle down the stem to be absorbed by the roots and used for photosynthesis. The bodies of many cacti have become thickened during the course of evolution, and form water-retentive tissue, and in many cases assume the optimal shape of the sphere (combining highest possible volume with lowest possible surface area). By reducing its surface area, the body of the plant is also protected against excessive sunlight. Most cacti have a short growing season and long dormancy, adapted to the rare availability of water. For example, a fully-grown saguaro cactus (Carnegiea gigantea) can absorb up to 3,000 liters (800 gallons) of water in ten days. This is helped by cacti's ability to form new roots quickly. Only two hours after rain following a relatively long drought, the formation of new roots begins. Apart from a few exceptions. an extensively ramified root system is formed, which spreads out immediately beneath the surface. The salt concentration in the root cells is relatively high, so that when moisture is encountered, water can immediately be absorbed in the greatest possible quantity. But the plant body itself is also capable of absorbing moisture (through the epidermis and the thorns), which for plants that are exposed to moisture almost entirely, or indeed in some cases solely, in the form of fog, is of the greatest importance for sustaining life. Most cacti have very shallow roots that can spread out widely close to the surface of the ground to collect water, an adaptation to infrequent rains; in one examination, a young saguaro only 12 centimeters (5 inches) tall had a root system covering an area 2 meters (7 feet) in diameter, but with no roots more than 10 centimeters (4 inches) deep. The larger columnar cacti also develop a taproot, primarily for anchoring but also to reach deeper water supplies and mineral nutrients (Patriquin 2007). Some cacti also have enlarged roots, as does the sweet potato, for storage of water and carbohydrates (Mauseth 2007). Like other succulents in the families of the Crassulaceae, Agavaceae (agaves), Euphorbiaceae (euphorbias), Liliaceae (lilies), Orchidaceae (orchids), and Vitaceae (some vines), cacti reduce water loss through transpiration by a process called crassulacean acid metabolism. Here, transpiration does not take place during the day at the same time as photosynthesis, but at night. The plant stores the carbon dioxide chemically linked to malic acid until the daytime. During the day the stomata are closed and the plant releases the stored carbon dioxide and uses it for photosynthesis. Because transpiration takes place during the cool humid night hours, water loss through transpiration is significantly reduced. This process is less efficient than the normal process of photosynthesis used by most plants, but it greatly reduces the loss of water (Stone 1983, Patriquin 2007). Cacti play very important roles in their environments. They provide a source for food and water for animals in desert environments, including deer, quail, wild turkey, pack rats, gophers, rabbits, and tortoises (Patriquin 2007, Taylor 1998). Their fruit is eaten by many animals, while woodpeckers nest in their stems. The saguaro's flowers provide nectar for hummingbirds, bats, as well as bees, moths, and other insects. Hummingbirds would have a difficult time migrating over the southwestern desert between their winter and summer ranges without cacti flowers as a source of food. Some cactus flowers form long tubes, up to 30 centimeters (12 inches) so that only moths can reach the nectar and thus pollinate the blossoms. There are also specializations for bats, hummingbirds, and particular species of bees. Goats, birds, ants, mice, and bats contribute significantly to the spreading of the seeds. Humans have long used cacti for food and other uses. The prickly pear (Opuntia stricta) is one of the most widely cultivated cacti. Both its fruit and stems are used as food for humans, as well as by cattle and other domestic animals. It was cultivated by Native Americans in Mexico and the southwestern United States, including California, for food and medicinal use. Its juice is used to relieve the pain of wounds and skin rashes. The prickly pear was introduced to Africa and Australia for cattle food and is also used as a natural thorn fence to protect livestock from predators. American horticulturist Luther Burbank experimented with the prickly pear and developed a spineless variety, which is still cultivated today. The prickly pear's introduction to areas where it is not native created problems and is on the ISSG Red List of the 100 worst invasive species, as well as being called "Australia's worst weed" since it covers hundreds of acres there, often 2 meters (6 feet) deep (Tilford 1997, ISSG 2007). Other cacti have also been useful to humans, including the saguaro (Carnegia gigantea), which bears edible fruit, and the peyote (Lophophora williamsii), whose juice has an hallucinogenic effect and is used in Native American religious ceremonies. Other cacti are also used for traditional medicinal purposes and are the subject of modern pharmacological research. The cochineal dye is a rich red dye which is produced by the female cochineal insect, which lives on cacti. It was used by the Aztecs and later by the Spanish, who introduced the cactus and the insect to the Canary Islands. Very expensive to produce, it is now used only for specialized purposes (Taylor 1998, Tilford 1997, Patriquin 2007). Interest in cacti has spread around the world since the discovery of the New World by Europeans. Christopher Columbus brought cacti back to Europe. Scientific interest in them began in the seventeenth century. By 1737, 24 species were known, which Linnaeus grouped together as the genus Cactus. With the passage of time, cacti enjoyed increasing popularity, both in scientific research and as garden plants. 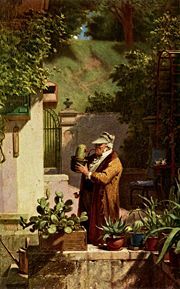 In the twentieth and twenty–first centuries, cacti began to be especially favored as garden plants in arid climates because of their ability to thrive with little or no irrigation. They require little maintenance and may provide food for native wildlife. Some species do well in areas with very cold winters. Cacti have become popular as indoor houseplants, including various South American tree-growing species with large, long-lasting flowers. which are known as orchid cacti and Christmas cacti (Patriquin 2007, de Cameron 2007). The popularity of cacti has led to instances of cactus poaching in which naturally growing cacti are dug up to be planted in gardens. Many species of cacti are endangered because of this as well as other threats to their environments. All cacti are covered by the Convention on International Trade in Endangered Species of Wild Fauna and Flora, and many species by virtue of their inclusion in Appendix 1 are fully protected (Marinelli 2005). Anderson, E. F. 2001. The Cactus Family. Portland, OR: Timber Press. ISBN 0881924989. Benson, L. 1969. The Native Cacti of California. Stanford, CA: Stanford University Press. Benson, L. 1981. The Cacti of Arizona. Tucson, AZ: University of Arizona Press. ISBN 0816505098.
de Cameron, B. 2007. Winter hardy cacti for water wise gardens. Colorado State University. Retrieved December 20, 2007. Invasive Species Specialist Group (ISSG). 2007 Opuntia stricta (shrub). Global Invasive Species Database. Retrieved December 20, 2007. Kiesling, R., J. D. Mauseth, and C. N. Ostolaza. 2002. A Cactus Odyssey. Portland, OR: Timber Press ISBN 0881925268. Marinelli, J. (ed.). 2005. Plant. New York, NY: DK Publishing, Inc. ISBN 075660589X. Mauseth, J. 2007. Mauseth research: Cacti. University of Texas at Austin. Retrieved December 20, 2007. Patriquin, P. 2007. Dalhousie Collection of Cacti and Other Succulents. Dalhousie University. Retrieved December 20, 2007. Salak, M. 2000. In search of the tallest cactus. Cactus and Succulent Journal 72:3. Stone, D. 1983. The Lives of Plants. New York, NY: Charles Scribner's Sons. ISBN 0684174075. Taylor, R. 1998. Desert Wildflowers of North America. Missoula, MT: Mountain Press Publishing Company. ISBN 08878423761. Tilford, G. 1997. Edible and Medicinal Plants of the West. Missoula, MT: Mountain Press Publishing Company. ISBN 0878423591. This page was last modified on 2 April 2008, at 03:58.